There stands a good chance that Avengers: Endgame might mark the final film for several Marvel favorites, but in the weeks leading up to the film's launch, the cast is keeping their minds off such grim outcomes. The Endgame press tour has been filled with laughter (like when Chris Evans teased his spoiler-spilling co-star Mark Ruffalo that he has "zero cred" in the Marvel universe) and emotional moments (like the deep discussion the stars had with Entertainment Weekly's Anthony Breznican for the outlet's upcoming cover story). However, there's no escaping the fact that the end is nigh, and that Earth's Mightiest Heroes will face a dangerous fight in Endgame. One member of the Endgame team who isn't letting the rest of the cast forget that harrowing reality is none other than Thanos star Josh Brolin, who has delivered a terrifying reminder to his fellow MCU stars. Taking to Instagram, Brolin posted a photo of a set chair with the Mad Titan's name written on it, plus the clenched-fist Infinity Gauntlet carefully sitting atop the seat's back. 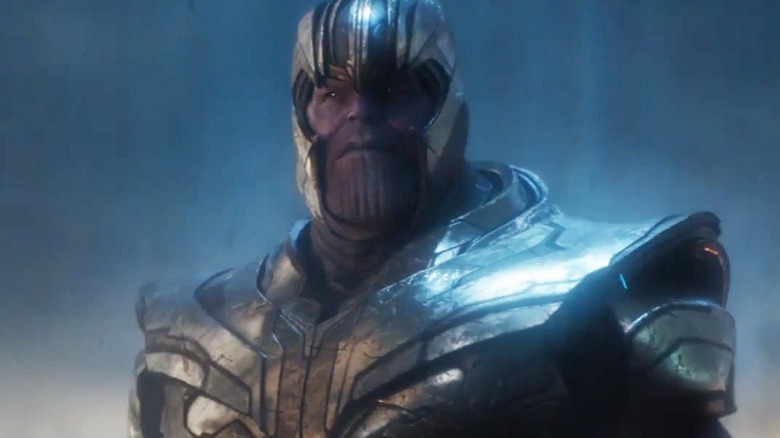 Brolin, taking on his character's voice in the caption, taunted the heroes who survived Thanos' snap that killed half of all living things in the universe and made it clear who has supremacy at the start of Avengers: Endgame. "When you all are done with all your interviews and your talk shows, I'll slip this perfectly fitting gauntlet back on and tell you a story about your future," wrote Brolin, reminding the Avengers and co. that they will have a tough time taking down Thanos after losing against him in Avengers: Infinity War. Just as Brolin's post hints, the Avengers: Endgame crew has been incredibly busy promoting the ensemble pic, directed by sibling filmmakers Joe and Anthony Russo. Everyone from Black Widow actress Scarlett Johansson and Hawkeye star Jeremy Renner to Thor actor Chris Hemsworth and Iron Man star Robert Downey Jr. and even Marvel Studios president Kevin Feige have been meeting up with entertainment media outlets for interviews, chatting with members of the press for print stories, and appearing on talk shows for additional promo. What they haven't been able to do during those events is, ironically, talk about what's coming in Endgame — or, as Brolin put it, discuss the story about the Avengers' future that Thanos will apparently tell. Marvel is keeping an airtight lid on Endgame details — and for good reason, as the studio doesn't want to ruin the moviegoing experience for anyone or risk marring what's meant to be the culmination of 11 years of stories in the Marvel Cinematic Universe. That said, the interviews the Endgame stars are giving and talk show appearances they're making are essentially hype-boosters rather than detail-dishings; the cast is being incredibly careful with their words, worried that even saying the film has an ending at all is a potential spoiler. In some ways, the lack of plot specifics and the hesitancy to talk too much about Endgame is a distraction from the inevitable: the un-dusted heroes are all but guaranteed to go head-to-head with Thanos once more. Still, everyone knows that's coming. The Endgame teasers, specifically the most recent special-look trailer, point toward the Avengers crafting a plan to take down the Mad Titan, reverse his Decimation, and resurrect the fallen heroes (plus the billions upon billions of other lives that were lost post-snap). What that mission entails is a total mystery, though. A theory that has gained more traction than others is that the team will gear up in their new suits (that look uncannily similar to the Quantum Realm ones featured in Ant-Man and the Wasp) and travel back in time to stop Thanos from ever coming close to getting his hands on the Infinity Gauntlet and capturing the Infinity Stones to power it. Another notion is grounded in something Captain Marvel (Brie Larson) said in the latest look at Endgame: the heroes may not turn back the clock but remain on the existing timeline, journeying through space to rip the Infinity Stones straight from Thanos' Infinity Gauntlet. Speaking of the Infinity Gauntlet, there's also the idea that the mystical armored glove won't be as powerful in Endgame as it was in the final moments of Infinity War, which saw both the Gauntlet and Thanos' arm suffer damage as a result of the Snap. The glimpses at Endgame we've gotten so far hint that the Gauntlet is charred, and the Russo brothers previously revealed that "there is a cost to using the power of the Stones." Both points suggest that Thanos will still face consequences if he tries to heal the Gauntlet and himself with the Infinity Stones in Endgame, and that he may not actually be able to use the Gauntlet to its full potential due to the damage it endured in Infinity War. Joe Russo added during a Q&A session following a screening of Infinity War that Thanos' arm is "burnt to a crisp," and explained that the damage extends to other parts of his body — including anything that's on his arm, like the Infinity Gauntlet. "The physical price is the extreme power that it took to enact his plan, he paid for physically, and when he sits down on the steps at the end of the movie you can see that it actually carries up into his neck and onto his face," Russo said (via Animated Times). "His arm is f***** up and anything attached to his arm is f****** up." On the audio commentary track of Infinity War, Joe Russo elaborated on the state of the Infinity Gauntlet and Thanos' arm, which reveals quite a lot about what shape the Mad Titan and his prized possession will be in at the top of Endgame. "The power that it takes to use all six Stones is significant, and clearly damaged the Gauntlet and damaged Thanos permanently," the director said (via ComicBook.com). "The power that it took Thanos to click his fingers — he's so dramatic that if you look closely at the film and the damage of the Gauntlet, you look closely at the very last scene, it damages his arm dramatically." So even though Thanos will evidently slip the Gauntlet back on and spin a terrifying tale about what his vision of the future holds for the heroes he didn't kill in his Decimation, there's a chance that the damage he has already done to the Gauntlet and to his own body will throw a wrench in his overall plan — whatever that may be. Heck, there may even be multiple Infinity Gauntlets floating around, one of which the Avengers could snag for themselves and use to fire back against Thanos. Right now, the ratio of answered questions to unsolved mysteries surrounding Avengers: Endgame feels like one to a billion, and no matter how hard we speculate about what could happen in the film, the only way to get the truth is to wait patiently until the film opens in theaters on April 26.